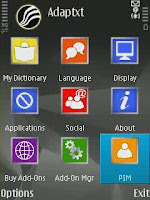 Following the release of Adaptxt version 2.3 in February 2009, I awaited in anticipation for the latest release of Adaptxt and its intelligent predictive text software. I loved version 2.3 but the application did have one or two irritating bugs, that I hoped the future update would erase. To my delight version 2.4 arrived much earlier than first anticipated (April) and didn’t disappoint. The download process was very self explanatory with an assortment of pop-up messages to smoothly guide you through the installation process. It took around 3 min’s to download completely. This version seemed to be around 2MB in size, so I installed two additional languages (Spanish & French) and the application ran as smooth as a baby’s bottom. I noticed that the personal dictionary default size had been increased from 500 words to the new default setting of 2500 and that instantly the suggestions where more accurate. Also, they seem to have increased the size of their already substantial selection of languages. 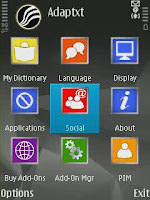 So if you’re multilingual you’ll be sure to find an array of language options to choose from. 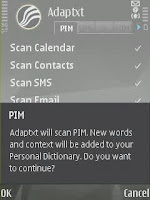 This new version introduced PIM & SOCIAL into the functionality of the software, allowing you to extract your social networking profile and other personal content from your phone into your personal dictionary. Allows you to choose what Adaptxt should scan, so you have the choice of scanning emails, SMS, domains, contacts and calendar. So basically Adaptxt learns all your files you write and read. 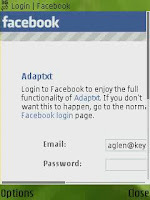 This application allows you to connect to Facebook (the only social networking service at present) where Adaptxt will pull your profile information to learn new contexts for your personal dictionary. On a whole this release was worth the wait. Adaptxt version 2.4 definitely is more intelligent in that it’s more accurate in suggesting word and phrase suggestions in advance, than its predecessor. It’s certainly still my preferred text input software by far. I haven't been able to register in their wen in order to buy Spanish add-on. Any clues? Followers or Fans. Either way, we're happy you are following!